With Kat away this evening, tonight we had investigative UFOlogist Thomas J. Carey,	author of Witness to Roswell: Unmasking the 60-Year Cover-Up, Inside the Real Area 51: The Secret History of Wright Patterson, The Children of Roswell: A Seven-Decade Legacy of Fear, Intimidation, and Cover-Ups, and The Roswell Incident: An Eyewitness Account with Don Schmitt. They also created the The Roswell Crash: Startling New Evidence! documentary. Thomas was one of those Great Guests who has no problem speaking at length, in detail. He went over the history of the crash, and details often overlooked by other authors. Thomas indicated the crash site is on private land, but that one can visit the International UFO Museum and Research Center and occasionally field trips are taken out there. Henry had Thomas speak about stenographer June Crain at Wright Patterson. She had a Q Clearance, cleared for atomic energy information, and she was provided knowledge on the Roswell crash and its occupants, and eventually broke her silence. I pointed out its current near $275.00 price, and Thomas was aghast, having paid its author James E. Clarkson all of ten bucks. Fortunately, I did learn that the book TELL MY STORY, June Crain, the Air Force & UFOs is available on Kindle for nine dollars. 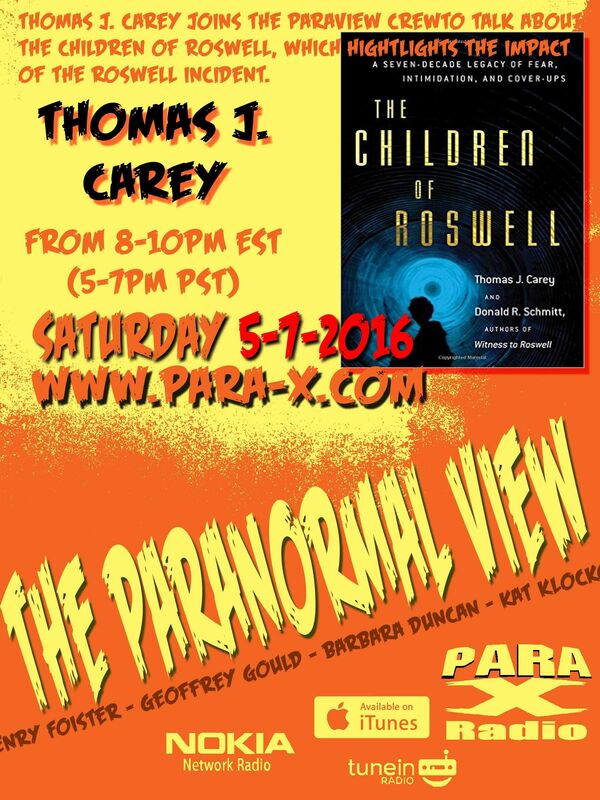 07 May 2016 The Paranormal View.